The Victoria Day long weekend is a great time to trying some hiking in B.C. 's backcountry, and the key to enjoying yourself is being prepared, says our expert. For many people in B.C. the Victoria Day long weekend is the unofficial start to the camping and hiking season, so the CBC's Jesara Sinclair set out to find out what novice hikers need to know to be prepared. Experienced backcountry camper Matt Armstrong, who works at Mountain Equipment Co-op in Vancouver, says the key to enjoying yourself is being prepared. Here are his eight tips for a safe hiking experience. To the uninitiated, a topographical map can look like a "bunch of squiggly lines," according to Armstrong, but he says it isn't hard to learn how to read one. The maps show elevations, and will give hikers an idea of how steep the terrain is, and how long the hike will take. Along with maps, hikers should carry and know how to use a compass, even if they're already equipped with a GPS. "One thing that's awesome about a compass is that it doesn't run on batteries, or use a cell phone tower signal. The compass is always going to work for you in the backcountry," says Armstrong. He suggests learning to use a map and compass in the city first, to navigate familiar landmarks, before heading into new terrain. It's important to have enough food and water in your pack, as well as a first aid kit, sunscreen, bug repellent, and a hat to keep the sun off. Armstrong says it's also important to bring proper clothing, especially in higher elevations. "While you're hiking you might be overheating, but as soon as you stop moving, you're going to start to feel that chill set in." It's equally important not to get carried away, and to only pack what you need. "If you do over-pack, it can lead to, first of all, a really heavy pack that's really uncomfortable, but also exhaustion and fatigue," says Armstrong. 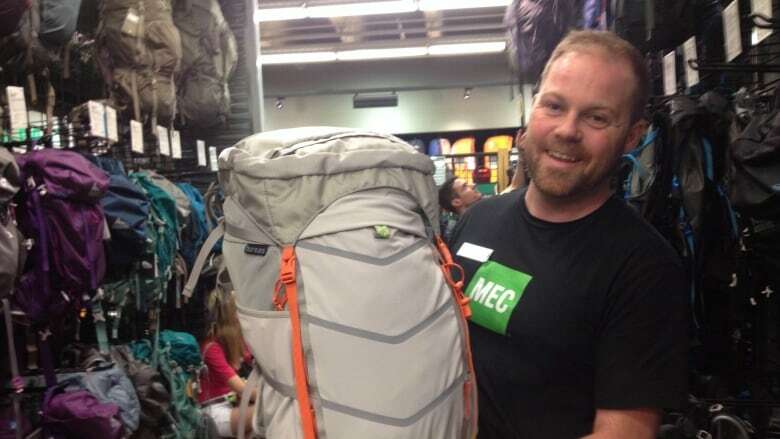 "If the pack is lighter, you're going to have a lot more fun. You're going to be looking at the scenery, enjoying your time in the backcountry. It's not about suffering and hurting yourself while you're out for a hike." Armstrong says dehydration will wear down even the fittest of hikers. "Water is really heavy, but it's very, very critical," he says. He recommends hikers get hydrated before heading out, to cut down on the amount of water they need to carry. Full water bottles are still a must for daytrips, says Armstrong. He recommends bringing a water filter or purification drops on multi-day trips, if there's a water source along the way. Armstrong admits the cost of gear can be daunting, but he says new hikers don't need to stock up on all the latest equipment. There are often great deals to be found buying used gear. He also recommends beginner hikers start by buying a few pieces of equipment, and slowly adding more to their collection as they take on longer and more difficult trips. "I just did little things at a time," he says. "I started with day hikes, I got my day hikers. Then I got my hiking pants and my shorts, and then I got my day pack, and then when I was ready to take on larger backpacking trips, all I really needed to do was upgrade to that one larger pack." Now that he has the basics covered, he's collecting items that add a bit of luxury to his backcountry trips. His favourite piece of gear right now is a collapsible wine glass and collapsible wine tote. Armstrong says you should always have a clear idea of where you're going, and how long it will take. Let friends and family in on your plan, so they know where to send help if you don't return within your expected time frame. "People take for granted how hard the terrain can be out there," Armstrong says. He says it's important to be honest about your own physical abilities, and whether you're capable of more challenging hikes. "No one wants to over extend themselves. When you head into the backcountry you really want to make sure that you're having a good time and you're not putting yourself or others at risk trying to take care of you," he says. Armstrong says there's nothing wrong with cancelling a trip, or changing plans last minute. It's important to check the weather forecast, and to prepare for the unexpected. Sometimes extreme conditions will force the trip to be postponed or moved elsewhere. Winter brings avalanche warnings, and in summer, areas may be closed to hiking because of extreme forest fire risk. Mountain Equipment Co-op hosts clinics and workshops to help hikers gain skills for the backcountry. Many are free, and you don't have to be a co-op member to sign up. Armstrong says if you can't make one of the workshops, many floor staff, including himself, can answer questions hikers can have. There are also a number of hiking clubs and outdoor groups around the Lower Mainland that can connect new hikers with more experienced ones.